Brilliant silver straw-yellow in color, our Chardonnay displays intense primary aromas of apple blossom, ripe pear, and sweet lemon drop, which are complemented by notes of toasty oak, spice, and cream. The wine's silky texture is overlaid with bright juicy flavors of rich, ripe apple and pear—lingering into a fresh, satisfying finish. This crisp, refreshing Chardonnay will complement the likes of fish prepared in lemon butter, pasta in cream sauce, and chicken dishes. Bright citrus and floral aromas introduce our Sauvignon Blanc. In the mouth, it is fresh and enduring, providing a good, but not heavy, volume. This Old World-style Sauvignon Blanc offers subtle minerality and notes of grapefruit and lime. The wine's acid is both balanced and integrated, giving it an elegant softness. 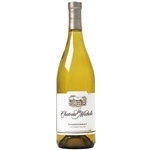 The Columbia Valley Chardonnay is a pleasurable, food-friendly Chardonnay. This is a fresh, soft style of Chardonnay with bright apple and sweet citrus fruit character with subtle spice and oak nuances. We blend Chardonnay grapes from vineyards throughout Washington’s Columbia Valley to make this a complex, interesting wine. The sur lie aging gives it an appealing softness. "Savory notes of chamomile and lemon verbena spark an interest on the nose. The palate offers a plethora of flavors, including ripe pineapple, a rare appearance of apricot nectar, and toasty-creamy oak on the finish. Texture plays an important role in showcasing a wine that significantly overdelivers with finesse and quality for the price." Hot weather means crisp whites, rosas, and of course sparklers. The Prosecco grape is grown in the Conegliano and Valdobbiadene wine-growing regions north of Venice. It has the classic light, fine bubbles along with nice lemon and mineral in the first few sniffs, then some nice pear and apple as we sipped away. It finished up with some light flowers and more tart lemon. This lovely Pinot Grigio is the color of pale straw. On the nose, the wine presents a fresh, floral aroma laced with hints of citrus fruit and subtle spice. The flavors are bright and clean suggesting apple and melon. A light bodied wine with balanced citrus and minerality that is a perfect for an apertif or a compliment with any light meal. The cool fog sweeps in each evening, giving way to warm, sunny days perfect for ripening world-class Pinot Noir. Estancia Pinot Noir displays luscious berry flavors, spice and a rich, supple finish.